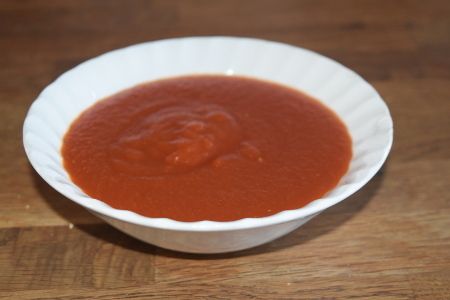 Tomato Ketchup is one of the most popular and versatile sauces ever to come into existence. Although there are so many brands and varieties to choose from, Heinz ketchup always seems to reign supreme – it was always my favourite too, until I made my very own homemade tomato ketchup for the first time. What a result. Homemade tomato ketchup is not only fantastic as a stand-alone sauce, but as a base for other sauces such as my Best Burger Sauce. Making your own ketchup provides so much more depth of flavour and freshness than any shop bought ketchup, so the small amount of extra time and effort to make it is completely worth it! Seeing as you have to actually cook this sauce, it takes a little longer than some of my other vegan barbecue sauce recipes – but trust me, it’s totally worth it! Heat together the vinegar and sugar in a medium saucepan. When the sugar has melted, add the rest of the ingredients apart from the cornflour. Keep on a medium heat and cover. When the mixture has come to a boil, turn the heat down a little and allow the contents to simmer for about 40 minutes. Take the pan off the heat and allow it to cool for a few minutes. Then transfer the mixture to a food processor and blitz. Pour the mixture from the food processor through a sieve back into the pan, so that you have a smooth liquid in the pan. 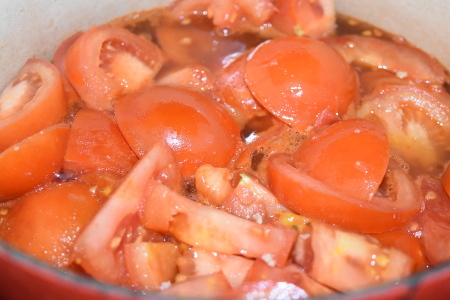 Use a spoon to push the tomato bits right into the sieve, so that you squeeze as much juice out as possible. Reheat your ketchup mixture, adding the cornflour and continuously stirring, making sure that there are no lumps – if you do come across any lumps, feel free to give it a little bit of a whisk or whizz with a hand-held food processor. Keep on heating until the mixture thickens into a ketchup consistency, which should take about 15 minutes. Finally, allow to cool before serving. If you’re not going to get through it all straight away, go ahead and bottle it up – it should keep well for about a week. I recommend serving homemade tomato ketchup on Chickpea and Mushroom Breakfast Sausages – I like it with a little bit of mustard too! Enjoy!